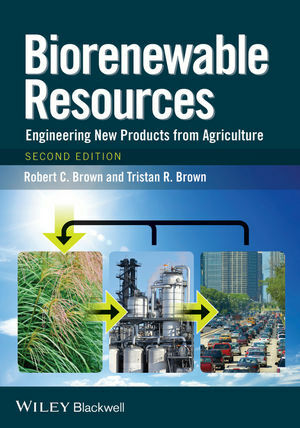 Biorenewable Resources: Engineering New Products from Agriculture, 2nd Edition will provide comprehensive coverage of engineering systems that convert agricultural crops and residues into bioenergy and biobased products. This edition is thoroughly updated and revised to better serve the needs of the professional and research fields working with biorenewable resource development and production. Biorenewable resources is a rapidly growing field that forms at the interface between agricultural and plant sciences and process engineering. Biorenewable Resources will be an indispensable reference for anyone working in the production of biomass or biorenewable resources. Robert C. Brown is Anson Marston Distinguished Professor of Engineering, Gary and Donna Hoover Chair in Mechanical Engineering, and Founding Director of the Bioeconomy Institute at Iowa State University. Tristan R. Brown is Graduate Lecturer and Research Associate at the Bioeconomy Institute at Iowa State University.